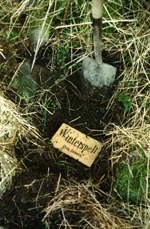 Winterspell was club hunt number two and was published in the January 1993 edition of the newsletter, again created and devised by club founder Dan James. The treasure was a Limoges porcelain statuette of Jack Frost. He stands on a rosewood base with the hunt name on a silver plaque. In his hand he carries a small bag of sterling silver and eighteen carat gold nuggets, collected during a particularly fruitful nights treasure hunting. The clues in the story led to the speckled ceramic casket buried somewhere in the North of England. The hunt lasted for two months until he was found by club member Paul Hiscox below a dry stone wall in Lancashire.